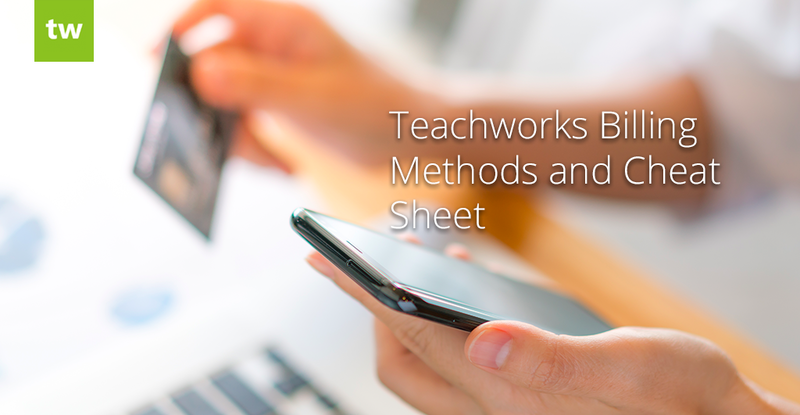 Teachworks offers a powerful tutoring business billing system that supports a number of billing methods. Whether you bill per hour or per month, we have a billing method to suit your business needs. 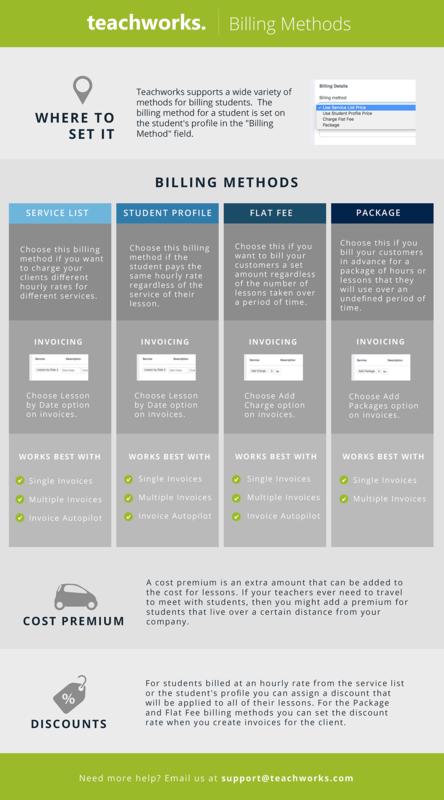 A student’s billing method is set directly on their profile, so you could offer a number of different options to your clients to accommodate their specific billing preferences. This is a great choice if you want to bill clients an hourly rate based on the service that’s selected for each of their lessons. With this billing method selected on the student’s profile, lesson costs are calculated when a service is selected on the “Add Lesson” form. You can also charge students a fixed hourly rate by selecting the “Student Profile Price” option. With this billing method selected, the system will look at the value captured on the student’s profile to determine lesson costs. Unlike the Service List Price billing method, this cost will not vary based on the selected service. Note: If you charge your students per lesson and not per hour, you can calculate an hourly rate that equates to the lesson cost and set this in your Service list. Here’s a guide. This billing method allows you to charge your clients upfront for a package of lessons or hours that can be used over an undefined period of time. You can find some more information here and here. We also have a cheat sheet to help you get started. Another popular billing method is our Flat Fee Billing method. This is a great option for companies that charge a subscription type fee. It allows you to charge your clients a fixed amount for an unlimited number of lessons over a certain period of time. In addition to the billing methods above, we also have a cost premium feature. This feature allows you to apply an additional charge per session (this charge is not affected by the duration of the session). This is typically used in a scenario where a teacher is required to travel a longer distance to meet with a student. More information here: Cost Premium. For students billed at an hourly rate from the service list or the student’s profile you can assign a discount that will be applied to all of their lessons. For the Package and Flat Fee billing methods you can set the discount rate when you create invoices for the client.